Yesterday, about four hours before hearing any news of bombs at the Boston Marathon, I had gratefully deposited my tax checks in the mailbox at the Hoboken post office and I was heading to the gym about a block away. En route, I saw what we’ve called since 9/11 an “unattended” bag sitting on the sidewalk next to a building. The closest person to the bag was standing 15-20 feet away, near the street. I approached him. “Is that your bag?” I asked, pointing. “Yes, it’s mine,” he said. I went on my way. Each time I do this since that fateful day in 2001, I feel a little bit like an alarmist. But I always talk myself into speaking up because it’s got to be a better feeling than not speaking up and having something awful occur. Hours later while the news was unfolding in Boston– two blasts, blood, lockdowns – I couldn’t stop the chills from erupting on my arms. The damn vulnerability keeps escalating. 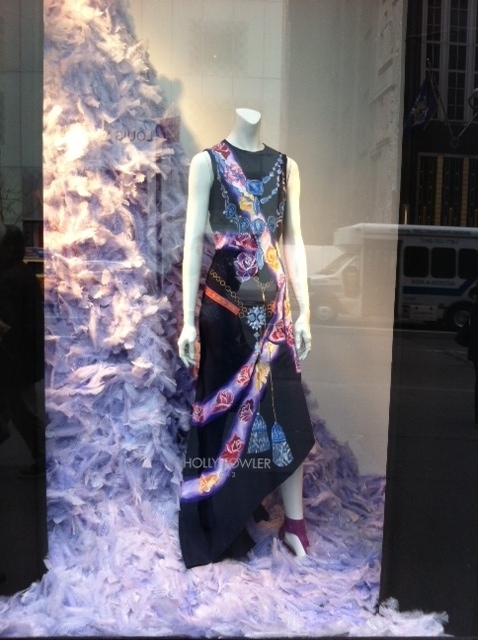 Staying above ground gives one the pleasure of sights like this in New York -- a Holly Fowler dress in a Bergdorf window. On and on it went. At some point I think I made a subconscious decision that if I was going to die in some kind of diabolical plot it was going to be above ground and not “down there” in the cavernous, dirty, creepy tunnels. So I did a lot more walking, not avoiding subways altogether but opting out more frequently. All of this came rushing into my head today because I had to go into New York after hearing it was on high alert in the wake of the unthinkable happening in Boston. High alert. Here we go. I was excited about meeting a friend for lunch on the Upper East Side and then going to facilitate a discussion with a group of women at a senior center. My route was simple: PATH to F train, where I’d exit at Lexington/63rd and pick up the 6 train a few blocks away. But when I got to the Lex/63rd stop there was a lot of construction on the platform and I had to confront one of my biggest fears – a narrow path between the temporary wall and the ledge next to the tracks. I walked in single file with my fellow passengers muttering “I hate this, I hate this, I hate this.” The three escalators it took to get to the street reminded me how far underground I’d been. Note to self: You’re not taking this route home. In fact, on my way to meet my friend, I called an audible and walked instead of taking the 6 train. Instantly I felt better, lighter. Come and get me above ground, you bastards, while I’m smiling and walking with a spring in my step. It began with a Kobe Bryant vent on Facebook, a wonderfully vulnerable sharing after his Achilles injury that ran the gamut – rage, questioning, self-pity, physical pain, perspective, and determination that his pending surgery become the “first step of a new challenge.” Then I had a quote from Brene Brown, whose popularity has rocketed since her TED talk on vulnerability and more recently her appearance on Super Soul Sunday on OWN. “Vulnerability is the core, the heart, the center, of meaningful human experience,” Brown says. At this time in our lives, is it really any wonder her talk is one of TED’s most popular? We are vulnerable when we get dressed and walk out the door. We are vulnerable when we tell someone how we feel, when we show up at someone’s funeral that we haven’t talked to in years, when we bear a child, when we ask someone to assist us, when we’re walking with a cane, when we let love in and especially when we let it flourish and plant a flag right there in our hearts. I hate feeling so weak and vulnerable. I hate that I am alone, and I always was. I hate that I made him into a superhero, he was not. I hate that he doesn’t want to kiss me. I hate that every time I cry over one boy it’s like crying over all of them again. What I hear in this is that we have a love/hate relationship with our vulnerability. We know we can’t live well without it. I was heartened by how much the women engaged in the conversation, spoke their truth and made clear their need to talk about what had happened in Boston. It was such a satisfying experience to be able to draw them out that way and give them a space to express. When I left I decided to stay above ground and grab a bus across 72nd Street and take it all the way to Fifth Avenue. The plan was to then walk a bit and play it by ear. Oh, how I love that stretch of Fifth from the Plaza down to Rockefeller Center. I can feel my own energy lift as I stroll. I paused to look at the windows at Bergdorf’s (and was introduced to the amazing Holly Fowler design pictured here) and stopped into the Lindt shop for a Stracciatella truffle (OK, two). I took a subway back from Rockefeller Center and as I made my transfer to the PATH I scurried past the police and the National Guard to catch my train. So much blue and camouflage. I hope they read my glance and smile on the run as an expression of gratitude for what they are making possible for the rest of us. The putting aside of fear just to live. It is, like it or not, our reality.